Fantastic fishing, Keith. Those chub look like long, sleek missiles. 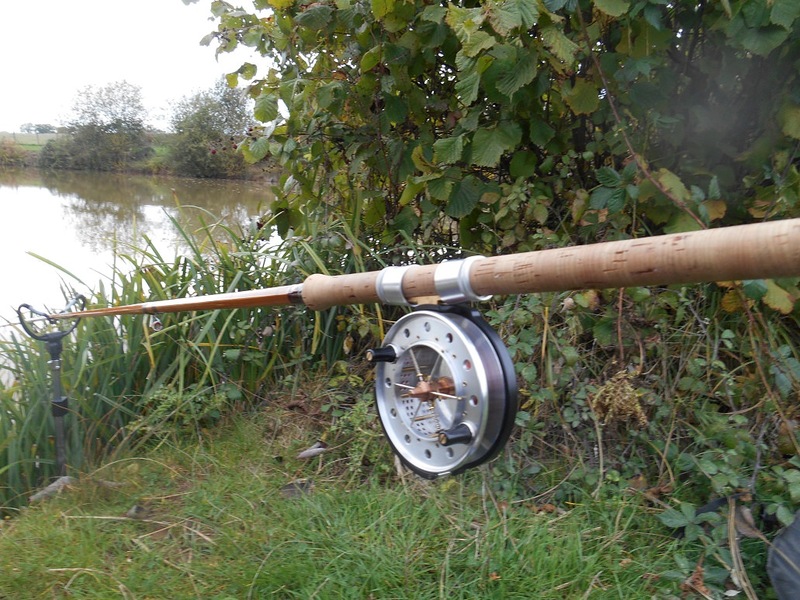 What a superb reel and seems a perfect match for the Craftversa. Today would be my last outing with Leszeks reel before I hand it over to the next tester and the intention was to try and find a Tench or two if that could be achieved. The weather started beautifully with clear blue skies, a warm sun and only a very light breeze - ideal conditions for me personally anyway. Sadly those conditions did not last and around 3.00pm the sky clouded over with heavy grey clouds becoming dominant, the temperature dropping to the degree where I needed to put my coat on and the wind getting up. 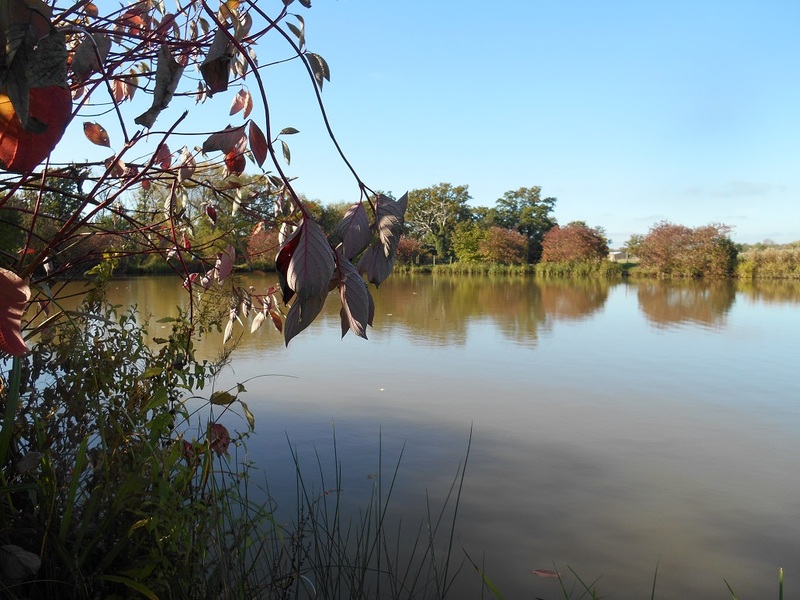 I would be fishing a pool where I have never blanked (unbelievable but true in the 15 years I have fished it generally 5 or 6 times a year) It contains a fine head of tench - rumour said a 6lber came out earlier this year, bream in the 3lb - 4lb range, roach to maybe half a pound and of course Carp which run to just shy of 30lb. 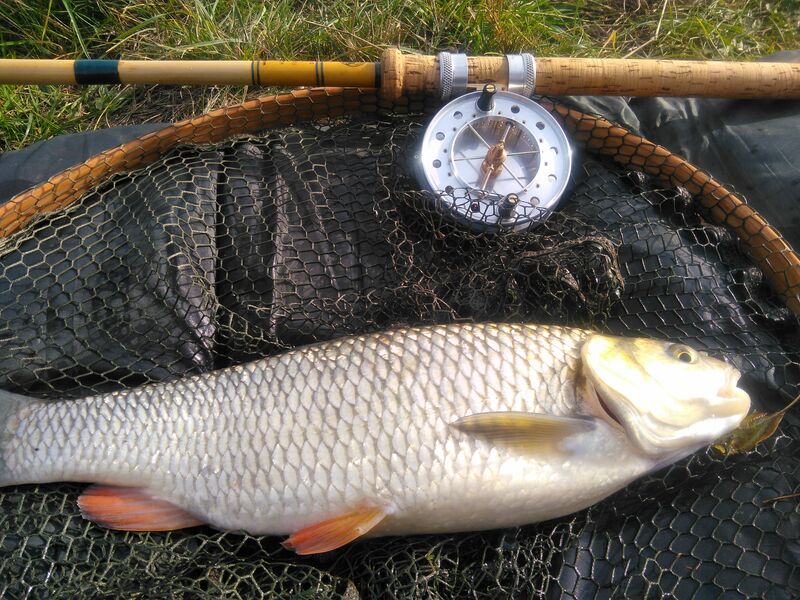 Tackle for the day would be a Chapmans F.J.Taylor Roach rod - Lezeks reel still loaded with 4lb Maxima, a 3BB waggler all terminating in a No. 10 Barbless hook. For bait I had prawns, luncheon meat and sweetcorn with some mashed bread and hemp. 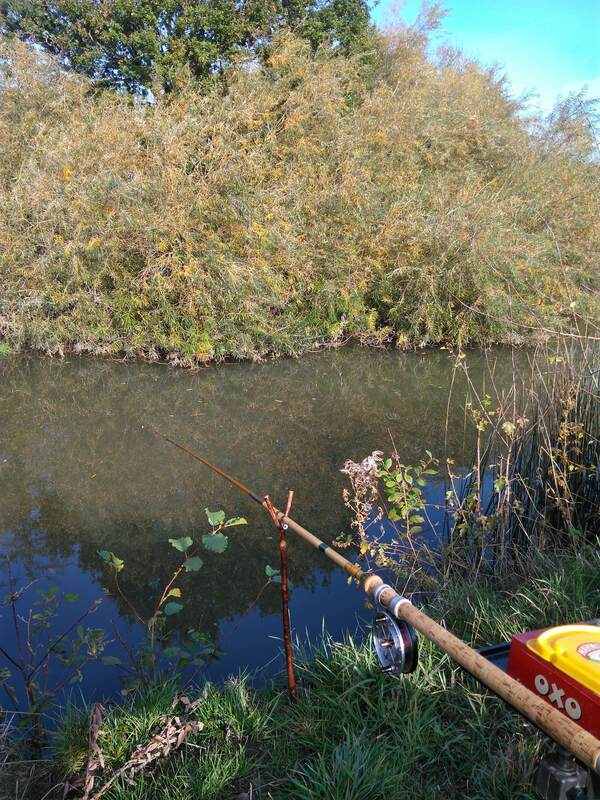 The tench are generally caught close to the bank and my swim was just around 5 feet deep so I would be fishing pretty close in maybe 10 feet from the bank. I stuck with prawns for 2 hours with no result so switched to meat fishing only 6 feet from the bank - the float shot away and with hand clamped over the drum the fish was hooked and at the same time the drum on ratchet sang a high pitched scream as the fish took 20 yards of line before I applied more hand pressure to the drum - the fish stopped then gave an almighty tug and the ratchet sang out again with a 15 yard run before I stopped it for the second time - another almighty tug and a 10 yard run whereupon it turned towards me at speed - the line went slack as I could not recover it quickly enough and the fish blew the hook out. I was somewhat devastated and knew it was a very good fish as the rod and my own Aerial Match with 4lb line has accounted for several mid doubles with relative ease. 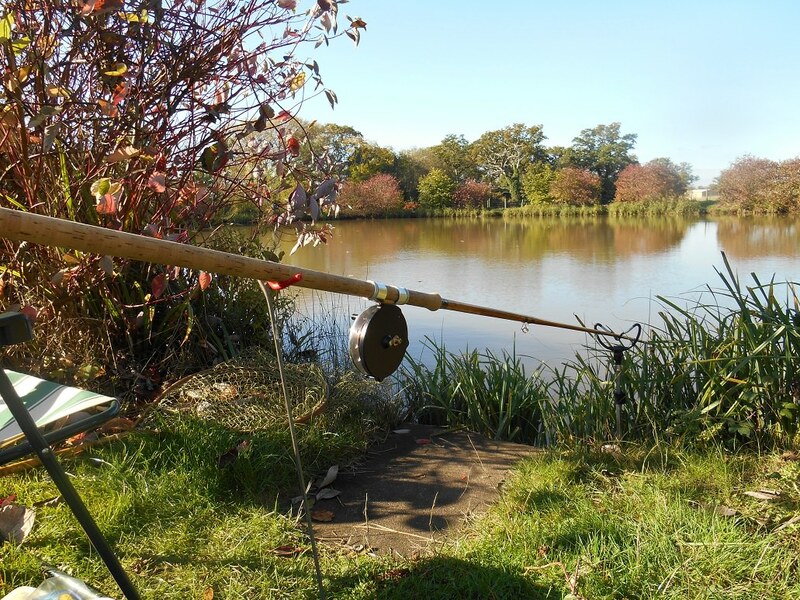 I settled down with a mug of coffee and cast out again putting the rod on two rodrests and noted there were quite a few carp moving about just below the surface with several 20 plussers in evidence. However, my attention was taken by a white scaled carp with yellow / golden flashes towards the tail - most unusual I thought as the reel sang out with line poring off the drum in a straight line with the rod. I clamped my hand over the drum but the fish had acquired substantial speed and the line parted just above the bottom shot. This was not going to plan and as time drew on I came to the last cast of the day in what were now cold and miserable darkening conditions. The float cocked maybe 10 feet from the bank carrying its final piece of luncheon meat and the disappearance of the float engaged with a decent Carp. It did not take too long to win the battle as the tackle was in control but imagine my surprise when I netted a white scaled carp with yellow / golden flashes. The Avon scales recorded the fish at a gnats over 11lbs. With the fish being somewhat frisky and camera shy I kept part of the landing net over its tail to discourage flapping about. 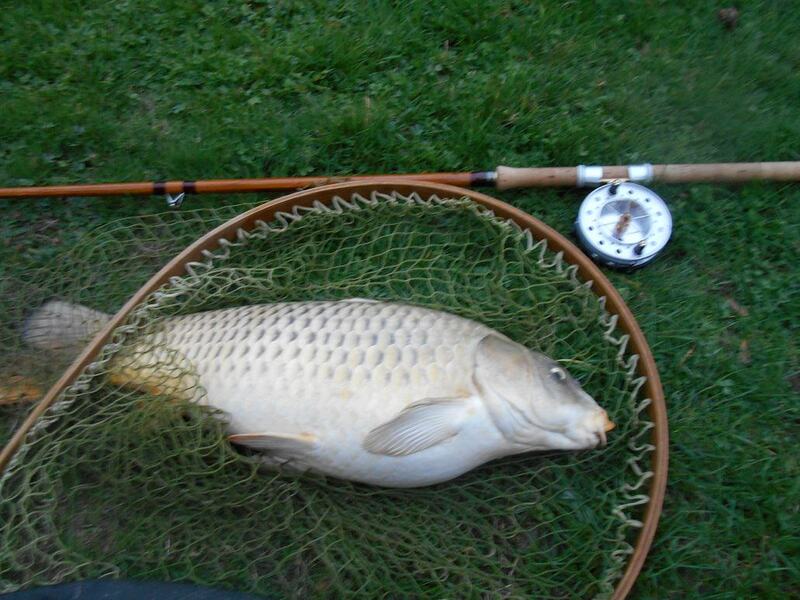 An absolutely splendid carp in perfect condition and not a scale missing. 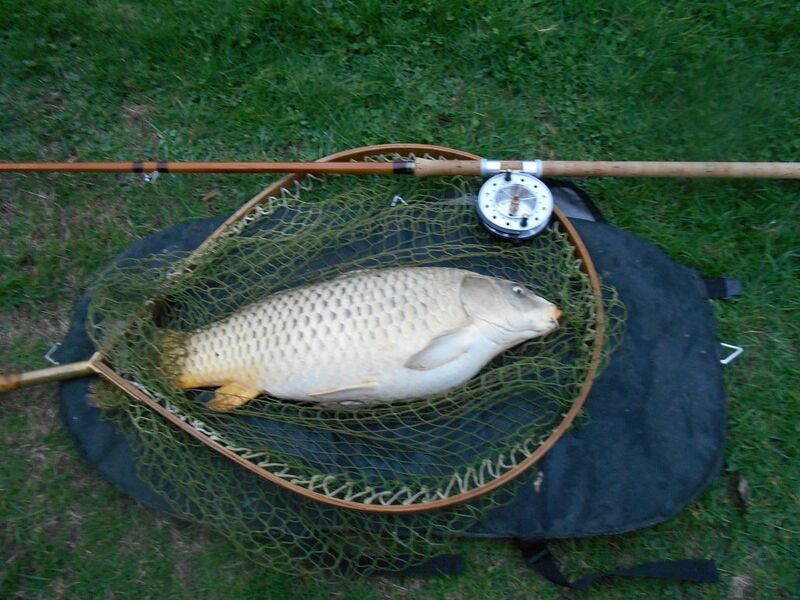 Sorry to miss out on the Tench but what a fish to make up for the disappointment. 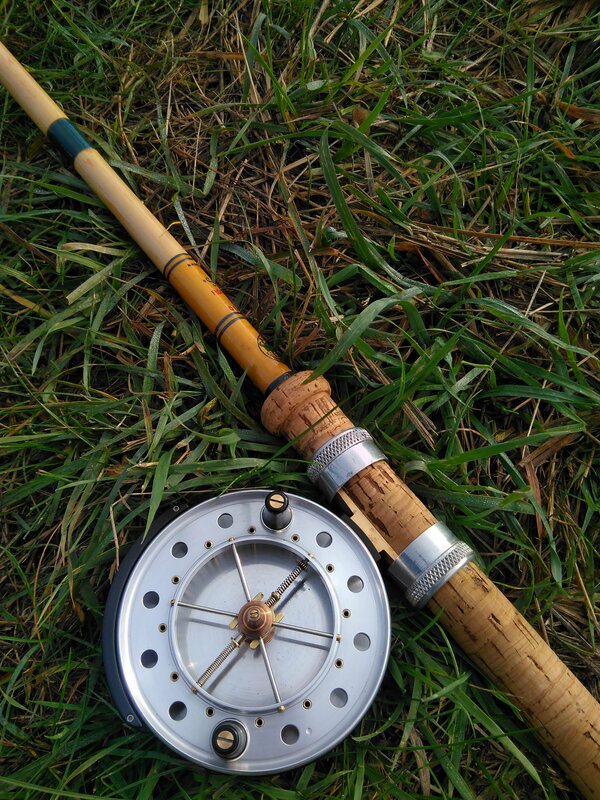 As for the reel - supreme top quality in my opinion - good line lay - no line trapping problems - no over-run issues and as smooth as silk. My only criticism is that the ratchet is on the light side for my preference but really that is insignificant when compared to its overall quality and performance. Bit late to this, but it’s been a reel (sic) enjoyable read to see your skill once again, Leszek. Well done PH, a great privilege and expertly done. To handle a brand new aerial, much less fish with one, must be something else. 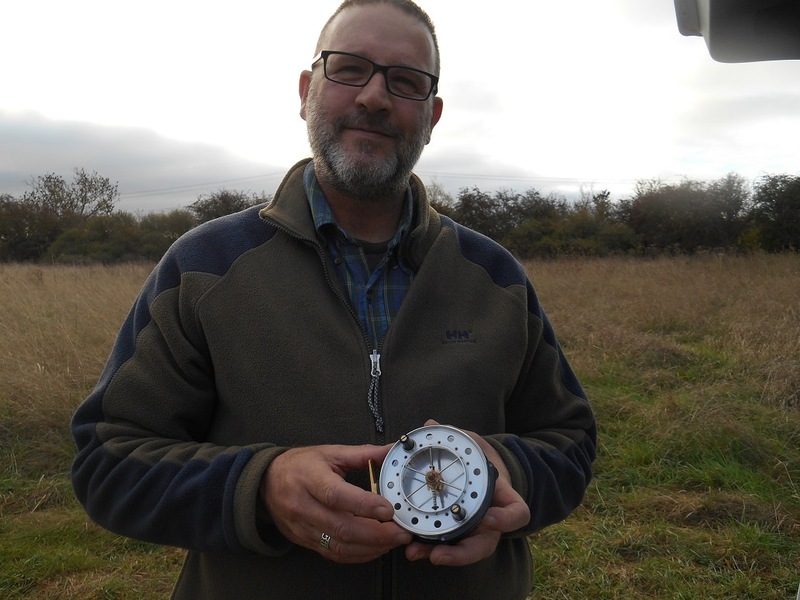 Today I met Steve Preston aka LuckyLuca at Tadpole Bridge whereupon the Aerial Match was handed over to tester no. 2 - the first of the experts. The event was recorded with this fine photograph (of the reel ). Congratulations Steve, let us hope that you live up to your forum name! The Aerial Match handing over ceremony was a highlight in what has been a pretty tough year so far. Watching from afar as Leszek walked us through the build process felt like a honour. To be able to lay my grubby paws on it was not something I'd dared to dream of. The reel is beautiful. Lady Luca has for the first time told me an item of tackle is pretty, high praise indeed! In addition to its good looks it has "the feel" Solid but not wieghty, fine but not flimsy. Hard to describe. Somehow I expected something bigger, I don't know why? Possibly because such work is so far beyond me that cannot fathom how it's accomplished? As Keith has said I took delivery at Tadpole bridge, fitting for me as it's quite probably the first river I fished as a child and now holds another special memory. 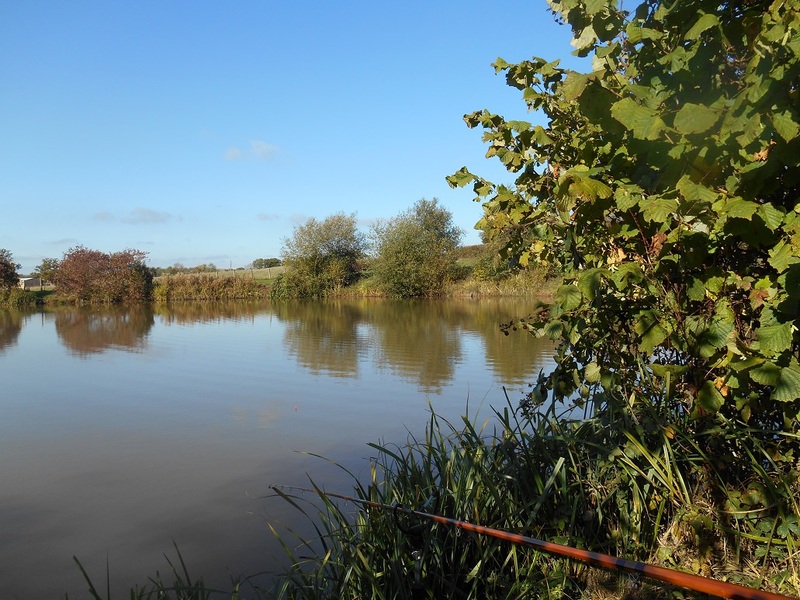 We chose to fish the weirpool end as a match and low water levels had left us with a more restrictive swim choice than the norm. Knowing I have the Aerial Match I chose to pair it with a floatcaster deluxe and attempt some trotting. This unfortunately wasn't the best plan. Rod and reel were perfect and will definitely get paired again. Recent rains seem to have livened the river up nicely and as I set up I could see and hear plenty of activity in front of me. A generous hand full of homemade ground bait produced encouraging swirls immediately, then something large broke through the surface, a flash of green and silver then gone. A few hours exploring the swim on various lines and depths produced nothing and every time I fed within seconds something struck from below. After lunch I decided to swap to the trusted "ever so easy" rig. A size 6 hook, 2 shot and a lump of plasticine. Tossed to the far bank as close as I dared to the over hanging willow. 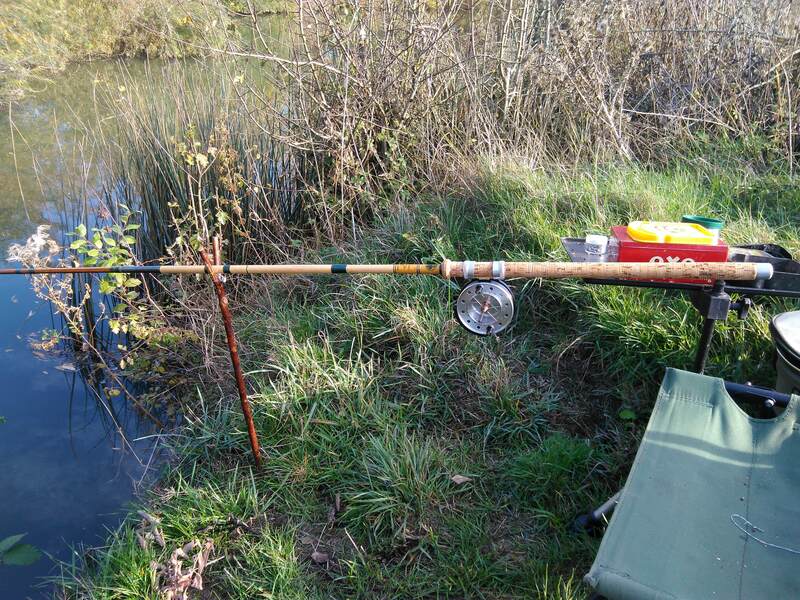 It a good job the rig is simple as I managed to launch everything into the trees twice before finding the desired spot. A little later, just as my eye lids were getting heavy the rod tip twitched, twitched again, then bent properly to the left. Rod lifted skyward I felt a chub pull back. Just under 3lbs and about as good looking as a chub could be I think. The reel was the star of the show. Trotted beautifully even in a pretty modest flow. As I said at the start I just feels right. Thinking back on my day I'm not sure if it was Jack pike ravaging my swim. 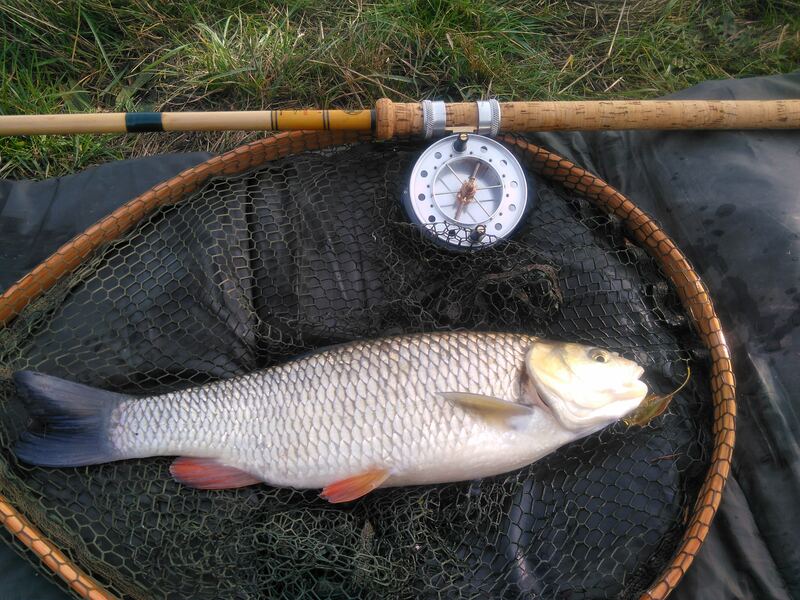 Twice I got a good but brief look at the culprit and would have sworn it was a chub I was glimpsing? Thank you Leszek for this opportunity. It's a lucky reel so far. Well it's made me feel even luckier than normal anyway! Last edited by LuckyLuca on Fri Oct 26, 2018 8:21 am, edited 1 time in total. Hmm - I must admit I was astonished when I saw your casting skills hit the willows on the far bank albeit 10 feet above the water - I was impressed as I could barely manage to cast half way across the Teme ( a river of similar width) from a bank also some 6 feet above the water level. I also glimpsed a large culprit leap from the water chasing the small fry and it did not look like a Pike - if it was a Chub then that was one really big Chub.